The new, $2.2 billion Salesforce Transit Center in San Francisco could remain closed for weeks as crews work to implement fixes to ensure the safety and structural integrity of the facility, transit authorities said during a Tuesday meeting of the Transbay Joint Powers Authority Board of Directors. The transit center was shut down Sept. 25 after work crews discovered a crack in a steel beam on the third level of the structure that crosses over Fremont Street. A second, parallel beam was found with signs of cracking shortly after. “My goal is weeks, not months” for a permanent fix to allow buses to return to the transit center, TJPA Executive Director Mark Zabaneh said Tuesday. A date for opening the transit center was not given. Crews are working toward shoring up the affected area temporarily to take the load off the cracked beams, which would allow for the reopening of Fremont Street under the bus deck by Oct. 12. Hydraulic jacks situated in the center of Fremont Street are providing temporary support to the structure. "And that’s an important milestone because that’s the milestone where the structure would be deemed safe and all the weight would be take off those two girders," said Dennis Turchon, senior construction manager with the TJPA. At least two weeks of tests would then take place to ensure the transit center is safe to open. "Beginning November we’re expecting to get the results of the testing, because Oct. 12 we can at that point take samples of the beams because the beam has been unloaded. Two weeks later, we should expect to get the results," Zabaneh said. "And at that point in time we should know what the cause is and what the fix is and what other assessments we need to do." The temporary hydraulic jacks will be replaced by a stronger temporary system of two steel pipes within days. Following testing of the cracked beams, a permanent fix will be implemented. "This is not the first time that steel has cracked. But in each case, the factors could be different, which is why there is the need to look at all the factors to determine what the cause might have been," said Bruce Gibbons, managing principal with Thornton Tomasetti. Zabaneh reiterated during the meeting that the cracking appears to be localized to the area directly above Fremont Street, and that testing on a similarly designed structure above First Street showed no signs of cracking. Zabaneh also said during the press conference that the rooftop park could open to the public before the transit center opens to bus traffic. The original discovery resulted in the closure of Fremont Street between Mission and Howard streets, leading to increased congestion in the South of Market area. Bus lines have since been routed to the previous temporary Transbay Terminal, which is only a couple of blocks away. Rerouted bus lines include 27 AC Transit lines, four Muni lines and four Golden Gate Transit lines. 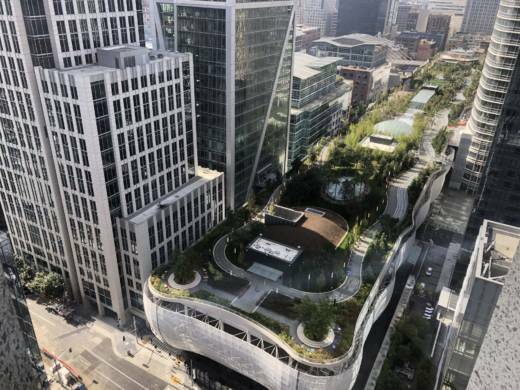 The Salesforce Transit Center opened Aug. 11 and has been dubbed the "Grand Central Station of the West." The three-block facility, a commanding presence in San Francisco's South of Market neighborhood, is financed by land sales, federal stimulus grants, district fees and taxes, bridge tolls, and federal and state funds. The five-level center includes a bus deck, a towering sky-lit central entrance hall and a rooftop park with an outdoor amphitheater. The online business software company Salesforce, which opened its adjacent 61-story Salesforce Tower four months ago, bought naming rights to the center in 2017 as part of a 25-year, $110 million sponsorship agreement. KQED's Peter Jon Shuler and Bay City News contributed to this post.